Melilla ( ; [meˈliʎa], [meˈliʝa]; Berber: Mřič; Arabic: مليلية‎‎‎, Maliliyyah) is a Spanish autonomous city located on the north coast of Africa, sharing a border with Morocco, with an area of 12.3 square kilometres (4.7 sq mi). Melilla, along with Ceuta, is one of two permanently inhabited Spanish cities in mainland Africa. It was part of the Province of Málaga until 14 March 1995, when the city's Statute of Autonomy was passed. Melilla is officially subject to a territorial claim along with the city of Ceuta. The current Berber name of Melilla is Mřič or Mlilt, which means the "white one". Melilla was an ancient Berber village and a Phoenician and later Punic trade establishment under the name of Rusadir (Rusaddir for the Romans and Russadeiron (Ancient Greek: Ῥυσσάδειρον) for the Greeks). Later it became a part of the Roman province of Mauretania Tingitana. Rusaddir is mentioned by Ptolemy (IV, 1) and Pliny (V, 18) who call it "oppidum et portus", also cited by Mela (I, 33) as Rusicada, and by the Itinerarium Antonini. Rusaddir was supposed to have once been the seat of a bishop, but there is no record of any bishop of the supposed see, which is not included in the Catholic Church's list of titular sees. As centuries passed, it went through Vandal, Byzantine and Hispano-Visigothic hands. The political history is similar to that of towns in the region of the Moroccan Rif and southern Spain. Local rule passed through Amazigh, Phoenician, Punic, Roman, Umayyad, Idrisid, Almoravid, Almohad, Marinid, and then Wattasid rulers. During the Middle Ages, it was the Berber city of Mlila. It was part of the Kingdom of Fez when the Catholic Monarchs, Queen Isabella I of Castile and King Ferdinand II of Aragon requested Juan Alfonso Pérez de Guzmán, 3rd Duke of Medina Sidonia, to take the city. In the Conquest of Melilla, the duke sent Pedro Estopiñán, who conquered the city virtually without a fight in 1497, a few years after Castile had taken control of the Nasrid Kingdom of Granada, the last remnant of Al-Andalus, in 1492. Melilla was immediately threatened with reconquest and was besieged during 1694–1696 and 1774–1775. One Spanish officer reflected, "an hour in Melilla, from the point of view of merit, was worth more than thirty years of service to Spain." The current limits of the Spanish territory around the fortress were fixed by treaties with Morocco in 1859, 1860, 1861, and 1894. In the late 19th century, as Spanish influence expanded, Melilla became the only authorized centre of trade on the Rif coast between Tetuan and the Algerian frontier. The value of trade increased, goat skins, eggs and beeswax being the principal exports, and cotton goods, tea, sugar and candles being the chief imports. In 1893, the Rif Berbers launched the First Melillan campaign and 25,000 Spanish soldiers had to be dispatched against them. The conflict was also known as the Margallo War, after the Governor of Melilla and Spanish General Juan García y Margallo, who was killed in the battle. In 1908 two companies, under the protection of Bou Hmara, a chieftain then ruling the Rif region, started mining lead and iron some 20 kilometers (12.4 miles) from Melilla. A railway to the mines was begun. In October of that year the Bou Hmara's vassals revolted against him and raided the mines, which remained closed until June 1909. By July the workmen were again attacked and several of them killed. Severe fighting between the Spaniards and the tribesmen followed, in the Second Melillan campaign. In 1910, with the Rif having submitted, the Spaniards restarted the mines and undertook harbor works at Mar Chica, but hostilities broke out again in 1911. In 1921 the Berbers under the leadership of Abd el Krim inflicted a grave defeat on the Spanish (see Battle of Annual), and were not defeated until 1926, when the Spanish Protectorate finally managed to control the area again. General Francisco Franco used the city as one of his staging grounds for his Nationalist rebellion in 1936, starting the Spanish Civil War. A statue of him – the last statue of Franco in Spain – is still prominently featured. On 6 November 2007, King Juan Carlos I and Queen Sofia visited the city, which caused a massive demonstration of support. The visit also sparked protests from the Moroccan government. It was the first time a Spanish monarch had visited Melilla in 80 years. Melilla (and Ceuta) have declared the Muslim holiday of Eid al-Adha or Feast of the Sacrifice, as an official public holiday from 2010 onward. It is the first time a non-Christian religious festival is officially celebrated in Spain since the Reconquista. 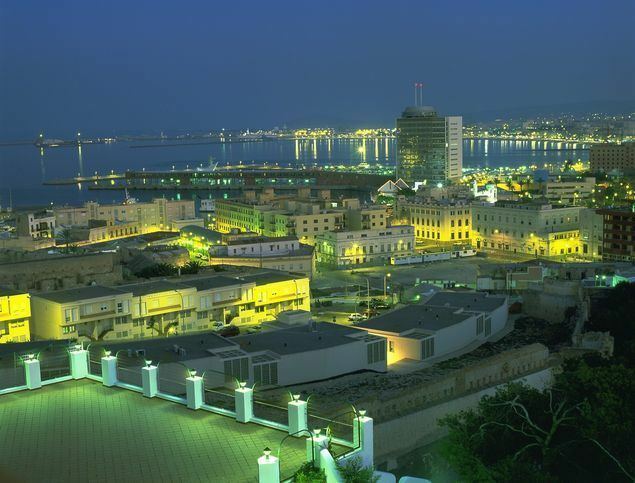 Melilla is located in the northwest of the African continent, next to the Alboran Sea and across the sea from the Spanish provinces of Granada and Almería. The city layout is arranged in a wide semicircle around the beach and the Port of Melilla, on the eastern side of the peninsula of Cape Tres Forcas, at the foot of Mount Gurugú and the mouth of the Río de Oro, 1 meter (3 ft 3 in) above sea level. The urban nucleus was originally a fortress, Melilla la Vieja, built on a peninsular mound about 30 meters (98 ft) in height. Melilla has held local elections for its 25-seat legislature every four years since 1979. Since its Statute of Autonomy in 1995, the legislature has been called the Assembly and its leader the Mayor-President. In the most recent election in 2011, the People's Party (PP) won 15 seats, maintaining the role of Mayor-President for Juan José Imbroda, who has held office since 2000. A regional splinter of the PP, the PPL, won 2 seats and governs in coalition. Opposition consists of the regionalist and leftist Coalition for Melilla (CPM, 6 seats) and the Spanish Socialist Workers' Party (PSOE, 2 seats). The government of Morocco has requested from Spain the sovereignty of Ceuta and Melilla, Perejil Island and some other small territories. 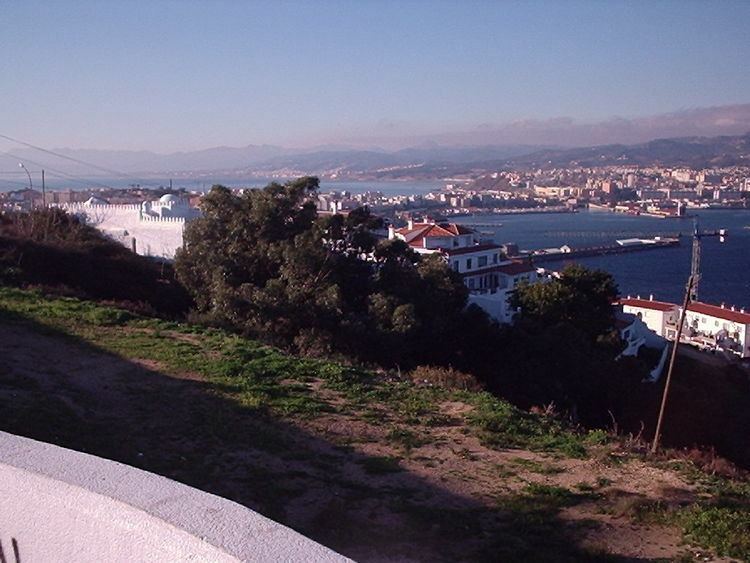 The Spanish position is that both Ceuta and Melilla are integral parts of the Spanish state, and have been since the 15th century, even before the foundation of Morocco as a country. Melilla has been under Spanish rule for longer than cities in northern Spain such as Pamplona or Tudela, and was conquered roughly in the same period as the last Muslim cities of Southern Spain such as Granada, Málaga, Ronda or Almería. Morocco denies these claims and maintains that the Spanish presence on or near its coast is a remnant of the colonial past which should be ended. The United Nations list of Non-Self-Governing Territories does not include these Spanish territories. 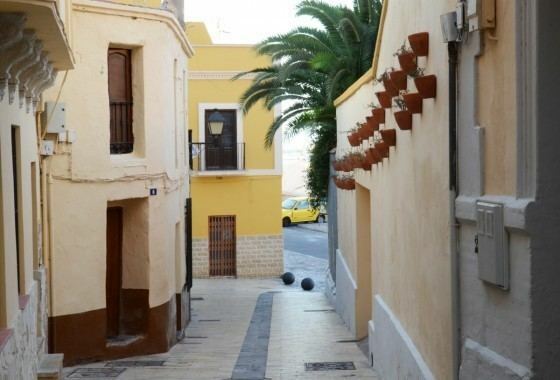 Melilla has a warm mediterranean climate influenced by its proximity to the sea, rendering much cooler summers and more precipitation than inland areas deeper into Africa. The climate in general has a lot in common with the type found in southern coastal Spain on the European mainland, with relatively small temperature differences between seasons. The principal industry is fishing. Cross-border commerce (legal or smuggled) and Spanish and European grants and wages are the other income sources. Melilla is regularly connected to the Iberian peninsula by air and sea traffic and is also economically connected to Morocco: most of its fruit and vegetables are imported across the border. Moroccans in the city's hinterland are attracted to it: 36,000 Moroccans cross the border daily to work, shop or trade goods. The port of Melilla offers several daily connections to Almeria and Málaga. Melilla Airport offers daily flights to Almería, Málaga and Madrid. Spanish operator Air Europa uses nearby Nador International Airport for their connections to mainland Spain. Many people travelling between Europe and Morocco use the ferry links to Melilla, both for passengers and for freight. Because of this, the port and related companies form an important economic driver for the city. Melilla's Capilla de Santiago, or James's Chapel, by the city walls, is the only authentic Gothic structure in Africa. In the first quarter of the 20th century, Melilla became a thriving port benefitting from the recently established Protectorate of Spanish Morocco in the contiguous Rif. The new architectural style of Modernisme was expressed by a new bourgeois class. This style, frequently referred to as the Catalan version of Art Nouveau, was extremely popular in the early part of the 20th century in Spain. 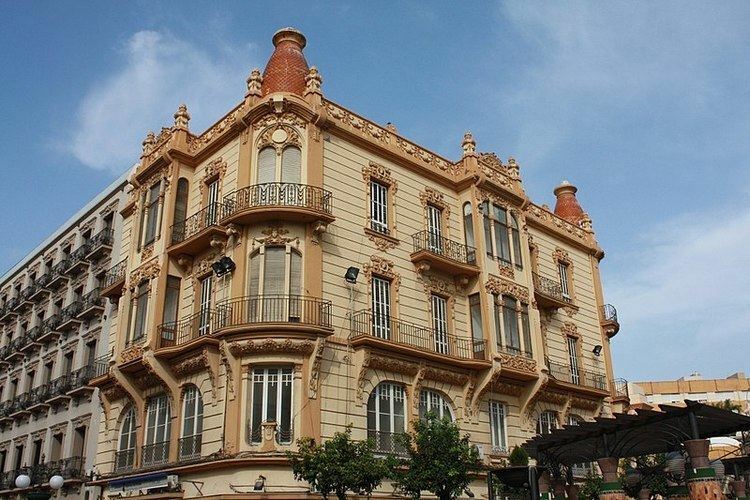 The workshops inspired by the Catalan architect Enrique Nieto continued in the modernist style, even after Modernisme went out of fashion elsewhere. 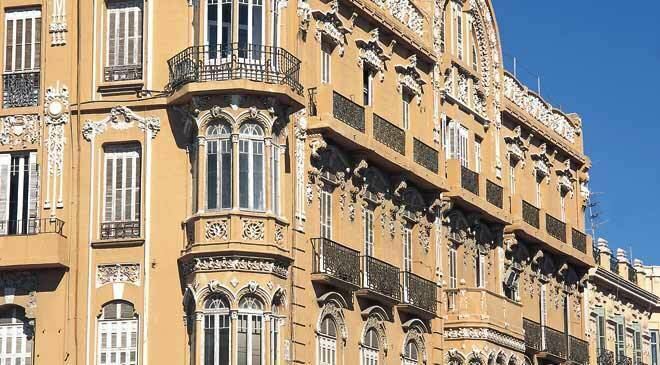 Accordingly, Melilla has the second most important concentration of Modernist works in Spain after Barcelona. Nieto was in charge of designing the main Synagogue, the Central Mosque and various Catholic Churches. Melilla has been praised as an example of multiculturalism, being a small city in which one can find four major religions represented. However, the Christian majority of the past, constituting around 65% of the population at one point, has been shrinking, while the number of Muslims has steadily increased to its present 45% of the population due to immigration from Muslim countries. The Jewish and Hindu communities have also been shrinking due to economic emigration to mainland Spain (notably Malaga and Madrid). Jews, who had lived in Melilla for centuries, have been leaving the city in recent years (from 20% of the population before World War II to less than 5% today). Most of the Jewish population has left for Israel and Venezuela. There is a small, autonomous and commercially important Hindu community present in Melilla, which numbers about 100 members today. The amateur radio call sign used for both cities is EA9. Melilla has been a popular destination for refugees and people leaving countries with poor economies in order to enter the European Union. The border is secured by the Melilla border fence, a six-metre-tall double fence with watch towers; yet refugees frequently manage to cross it, avoiding the attempts by Spanish police to send them back to their home countries. Detection wires, tear gas dispensers, radar, and day/night vision cameras are planned to increase security and prevent illegal immigration. In February 2014, over 200 migrants from sub-Saharan Africa scaled a security fence to get into the Melilla migrant reception centre. The reception centre, built for 480 migrants, was already overcrowded with 1,300 people. Melilla Airport is serviced by Air Nostrum, flying to the Spanish cities of Málaga, Madrid, Barcelona, Las Palmas de Gran Canaria, Palma de Mallorca, Granada, Badajoz, Sevilla and Almería. In April 2013, a local enterprise set up Melilla Airlines, flying from the city to Málaga. The city is linked to Málaga, Almería and Motril by ferry. Three roads connect Melilla and Morocco but require clearance through border checkpoints. Melilla is a surfing destination. The city's football club, UD Melilla, play in the third tier of Spanish football, the Segunda División B. The club was founded in 1943 and since 1945 have played at the 12,000-seater Estadio Municipal Álvarez Claro. Until the other club was dissolved in 2012, UD Melilla played the Ceuta-Melilla derby against AD Ceuta. The clubs travelled to each other via the Spanish mainland to avoid entering Morocco. The second-highest ranked club in the city are Casino del Real CF of the fourth-tier Tercera División. Football in the exclave is administered by the Melilla Football Federation.